With election day finally here, many Americans are less than enthused over their choices in the polls. But that shouldn’t stop anyone from exercising their right to vote. In the same way, we all have the opportunity to make an empowering choice each day, except instead of standing in a voting booth to make that choice, we do so standing in our own closet. Instead, start putting your clothes to work for you by focusing on a few wardrobe essentials you know will last and make you feel great, and then building your everyday wardrobe around them. Every woman needs a classic white shirt in her closet. I’m not talking about your dad’s stiff white Oxford; today’s classic white shirt is soft and sculpted to a woman’s body. This shirt is a workhorse and pairs well with a suit for work, and then transitions to evening with a pair of jeans and a statement necklace. Like the perfect white shirt, every woman needs a go-to little black dress that makes them look and feel great. But as I’ve matured, so has my idea of the LBD; after all, the last thing my teenage daughter wants is to be seen with me in something too short or too trendy. At the same time, I do see a slight glimmer in her eye when I show up for lunch looking hip and I hear her friends whisper as I walk away, “Your mom’s cool”. This Rachel Roy dress accomplishes all of the above. I love that I can pair it with a jean jacket and booties for said surprise school lunch with my daughter. I love that it transitions to cooler weather simply by adding opaque tights, knee boots and a moto jacket (see #6 below). And I love that you can’t go wrong by wearing it on its own with a pair of classic black heels for date night. In fact, you might just love it so much that you decide to pick it up in a color other than black (it also comes in Campari, Neptune and Oyster). Am I the only one who wishes she could dress in a blanket sometimes? While it has yet to become socially acceptable to drop the kids off at school or show up to work in a robe, wearing a cashmere sweater has pretty much the same effect on my psyche. When your outfit is classic and understated, a fun print can actually function as a new neutral. If you’re not sure how daring you want to be just yet, try these Daya by Zendaya Kyle Pumps in Black & Silver Mesh. However, if you’re ready to walk on the wild side, go straight for the Multi-Floral. 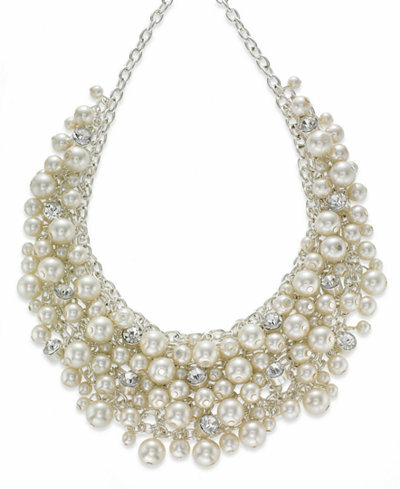 One of the first things I tell friends looking to freshen up their wardrobe is to add a statement necklace. The perfect piece of jewelry will not only transform your outfit, but help you express your personality and stand out from the crowd. These may not be your grandma’s pearls, but that doesn’t mean you can’t borrow the classic trend and give it a modern twist. Go for a choker with a V-Neck like the cashmere sweater above, or a longer pendant necklace with a tunic or the LBD above. Any stylist will tell you, the easiest way to complete an outfit is with a perfect-fitting jacket. When you slide on the right style, it defines your waist and gives shape to all the right places. The jacket of choice this fall is the Moto Jacket. I love the idea of going beyond basic black and embracing a simple print like this Tommy Hilfiger Plaid Moto Jacket. Whenever I see a friend rocking this look, it reminds me once again that the Moto Jacket is the perfect marriage of fashion and functionality. Of course, underlying all these items is one thing you can’t buy and store in your closet: confidence. If you don’t feel confident, you won’t look confident, no matter what you put on. So go on, find those pieces that really speak to you. No one has to know what you paid, only that you look like a million dollars. Don’t forget, the choice is up to you: you can either use code VOTE through 11/8/16 to save an extra 20% off + get free shipping with your purchase of $50 or more OR use code VOTE25 (or this Macy’s Savings Pass) to save $10 off your $25 purchase. Now that’s an election choice we can all get behind!